L-lysine is an essential amino acid, which are building blocks of proteins. Animal- and plant-based proteins are made from different proportions of the 23 amino acids that exist in nature. There are 10 essential amino acids that the human body cannot make and must obtain through food. Lysine is found in various food, most notably meats and nuts, but some plants are also rich in lysine. You should consult with your physician before taking an herbal supplement. Within the body, lysine plays major roles in calcium absorption, building muscles, repairing connective tissue and synthesizing certain enzymes, antibodies and hormones. More specifically, lysine is a serotonin antagonist, which can reduce feelings of anxiety, stress and depression. A 2004 Syrian study published in the "Proceedings of the National Academy of Science U.S.A." found that when researchers fortified grain with lysine, families eating the grain showed reduced markers of stress and anxiety -- as measured by cortisol levels. People deficient in lysine may also recover more slowly from surgical procedures and sports injuries. Amaranth, or pigweed, is often thought of as a pesky weed, but it was used as a food source and medicinal herb by various Native Americans, including the Aztecs. Amaranth seeds and leafs are excellent protein sources and contain many nutrients, including lysine. The lysine in amaranth is used to treat the herpes virus, which causes genital herpes and "cold sores" around the mouth. In general, lysine is an immune system booster. Consult your doctor before choosing an amaranth supplement. 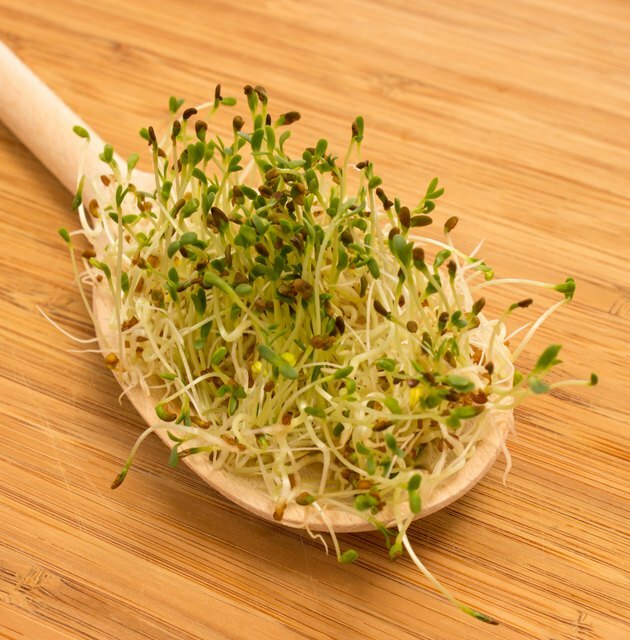 The alfalfa plant contains various nutrients in abundance, which makes it one of the most nutritious food sources known. By weight, 25 percent of the alfalfa plant is protein and it contains a relatively high amount of lysine, according to the book "Nutritional Sciences." Alfalfa has been used to decrease blood cholesterol levels, improve blood clotting and increase appetite. Before supplementing your diet with alfalfa, you should talk to your doctor, particularly if you are recovering from surgery or an injury. Wheatgrass is considered another nutritious plant rich in protein. According to "The New Encyclopedia of Vitamins, Minerals, Supplements, and Herbs," there are 103 known elements and wheatgrass contains them all, including the full spectrum of essential amino acids such as lysine. Wheatgrass is especially rich in chlorophyll, and its juice is similar to the molecular composition of human blood. Leafs and seeds from Mentha plants, better known as mint, are a source of protein and lysine. To be considered a good source of lysine, more than 5 percent of the plant protein must comprise the amino acid. Relatives of the mint plant also contain lysine and include basil, lavender and rosemary. Talk with your doctor about possible side effects before adding large quantities of any of these herbs to your diet.